5150 Elm’s Way is a French Canadian horror film that wants to be so much more. 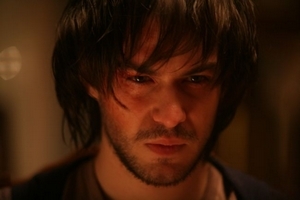 Yannick’s (Marc-André Grondin) moved off to college, away from both his girlfriend and his parents, and is exploring his new town when he happens to come off his bike in Elm’s Way. Having totalled his ride and grazed himself badly, he asks the owner of number 5150 for assistance so he can ring a taxi. Big. Mistake. As you can probably imagine, the inhabitants of 5150 Elm’s Way are a bunch of psychos. At first glance, this film feels like another Mum & Dad, a film that disgusted me at last year’s Melbourne International Film Festival. As it turns out, 5150 Elm’s Way isn’t quite so needlessly depraved, however the fear that things could take a turn for the worse at any moment did overshadow my enjoyment of the first half hour or so of this film. Jacques Beaulieu (Normand D’Amour) is the man of the house, and the one who’s intent on making life miserable for young Yannick. We’re not given any explanation for his behaviour, other than the fact that he is clearly a religious nut. This is one of the major flaws of the film – it’s simply too easy (and predictable) to pass off homicidal mania as a by-product of religious extremism. If you’re going to do it, do it with style (à la any time Stephen King does it, or Andrew Kevin Walker’s Se7en), otherwise, you’re simply being lazy. Jacques spends a lot of time going on about being righteous and killing the unrighteous, but it just isn’t very interesting. Where the film does get interesting is unfortunately also one of its other major flaws. Very soon we realise that this isn’t your normal horror film. In fact, some sort of Stockholm Syndrome soon rears its head, as Yannick becomes more than simply a young man for Jacques to keep imprisoned, but in fact becomes someone he can mould. From here the film regularly slides into arty territory, and whilst it’s rather classy, it doesn’t fit with the initial premise. I can’t imagine that this film would please many people. Arthouse fans wouldn’t go to see a film like this anyway, and horror fans would find themselves more and more frustrated to find out that 5150 Elm’s Way is not going to deliver the horror movie elements that it so requires (particularly in the frustrating final act). To its credit, the film is quite convincing in its efforts to make us believe in Yannick’s predicament, and in the first portion of the film he makes quite a few impressive attempts at escape. Also, there are some trippy special effects on display later on as Yannick begins to lose his mind and the film becomes something else entirely. Overall, 5150 Elm’s Way is an interesting but ultimately failed experiment. Despite starting off firmly entrenched in the genre, it then tries to move in a different direction entirely, and it simply doesn’t work.